Video is an important part of digital marketing strategy. It is not very expensive to produce professional footage and distribute it. Live video streaming is also becoming a power tool for brands to market themselves online and to expand their brand reach. 1. Brands that are considering live streaming should have a strategic plan that contributes to digital marketing strategy. 2. They should have clear goals and benchmarks ahead of going live. 3. 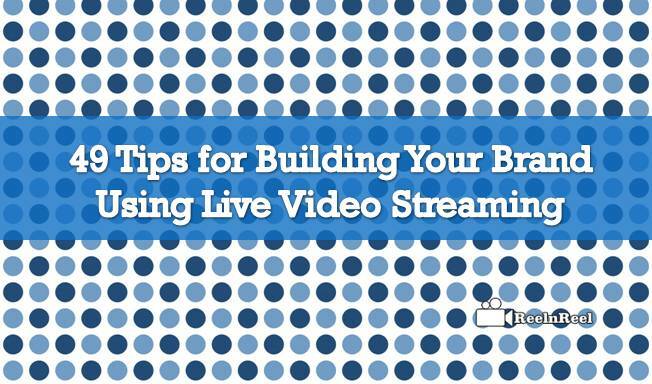 The goals of live streaming for building brand can be different. it can be entertaining the audience, supporting the fans etc. 4. Collaborating with the partners help to reach already engaged partners through live streaming. 5. Call to action must be included in live streams. There must be a designated place to send the audience after they watch the live streaming. 6. The call to action should be made simple and direct. 7. Reshare the live streaming recording video across social channels. 8. Brands should respond to the comments of the audience to the streams. Answer the questions they ask about the brand and offer solutions to their problems. 9. To live stream, the internet connection should have high speed. 10. To join the live stream, people should know about it there for creating a teaser and post it for the followers and the subscribers. 11. There is no need to have a script for live streaming but it is a good idea to draft some bullet points. 12. Live streaming need not be used just for selling products, it can be used to engage the audience. 13. Brands can ask the followers to share their experience with the brand with others in live streaming. 14. Tutorials and how to videos are the type of videos that are popular and these are proved to increase audience engagement. 15. Trade shows or community outing events live streaming will also help the brands. 16. Research for the type of content that develops the connection between the followers and the brand. 17. The live streaming should deliver the right message. 18. Brands should understand that pushing the product is not as important as building association between brands and audience. 19. Offer deals and special discounts for followers that watch the live stream. 20. These way conversions will be increased and there will be growth in a number of followers. 21. Live streaming can be taken to the next level by improving the internet connection speed. Switch to Wired LAN connection instead of WiFi. 22. Keeping close to the WiFi router can strengthen the live stream and avoid connection problems. 23. Viewership can be gained by interacting with the viewers. 24. Having a live chat window next to the broadcast can help interacting and engaging with the audience. 25. Conduct question and answer session to offer solutions to problems of the audience. 26. Back up the live stream and create the video on demand files so that viewers can access them at any time. 27. Promote the broadcast ahead of schedule so that number of audience will increase and also let the viewers know how to access the stream. 28. Keep organized to make the live streaming easier. 29. Keep things like fixing equipment ready. 30. Test run the streaming before going live. 31. Check for sound, light and encoder problems. 32. Also check the microphones, cameras and other equipment. 33. Use a content delivery network provider for streaming. 34. Do not shoot your video in high definition because all viewers will not have devices to watch the broadcast in HD. 35. Use the standard definition for streaming so that a large number of an audience can participate. 36. An important tip for the broadcaster is to be on time. 37. Be there fifteen minutes before the live streaming begins to engage the viewers who are early. 38. Brands should share the live event with their audience so that it becomes easy to make the viewers feel connected to the brands. 39. Create stories for viewers. 40. Keep an eye on the comments of the viewers. 41. Take the feedback from the viewers about the live streaming and ask them whom they would like to meet. 42. Interview the employees and clients of the company to increase engagement. 43. Give an opportunity to the viewers to see how the products or services are created. 44. Behind the door, live streaming videos are great sources for building the brand. 45. Live streaming should be tailored to the needs of the audience but the better response. 46. Social media live streaming has great potential to reach beyond the brand’s network. 47. Show the customers that you care for them. 48. Brands can use the live streaming for new product launch. 49. Hold weekly company news live stream. The key to effectively using live streaming is to make them interesting and entertaining to create customer loyalty. Add humor, depth and feel to the content.